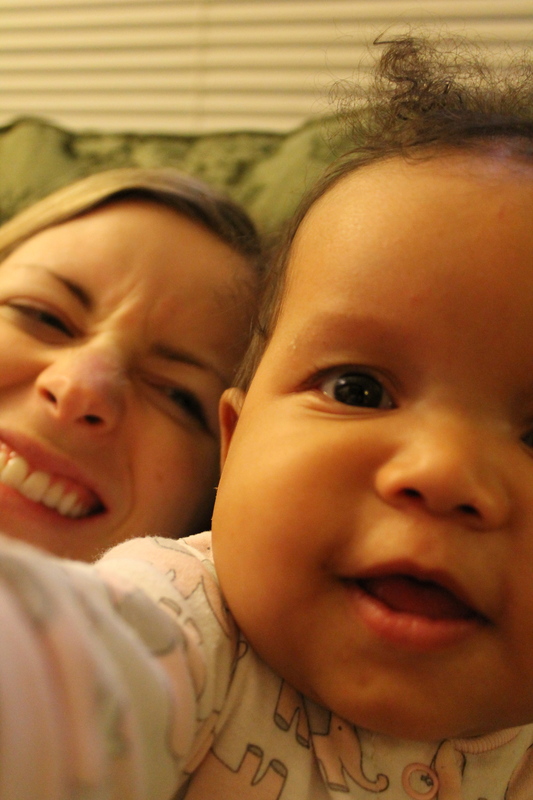 If you’re just joining us, I’ve been trying to write a “day in the life” post every 3 months so that I can keep track of how Zoe is growing and developing over time. And now…15 months! 6:00 Zoe wakes David up. I unwittingly stay asleep. I rush out of bed apologizing and David says “babe, I was trying to let you sleep in!” I realize that I’ve thwarted his plan AND the possibility of extra sleep. Dang. David sits down to eat some eggs and toast. Zoe suddenly develops an interest in being on his lap. I wonder why? 7:00 I make Zoe her own breakfast so she can stop mooching off of daddy. Toast with PB&J for both of us. David hangs out with us and talks. Zoe says “no no no” to yogurt and throws her bananas off her tray. 7:20 David goes to our bedroom to get dressed for the gym. Zoe trails him. 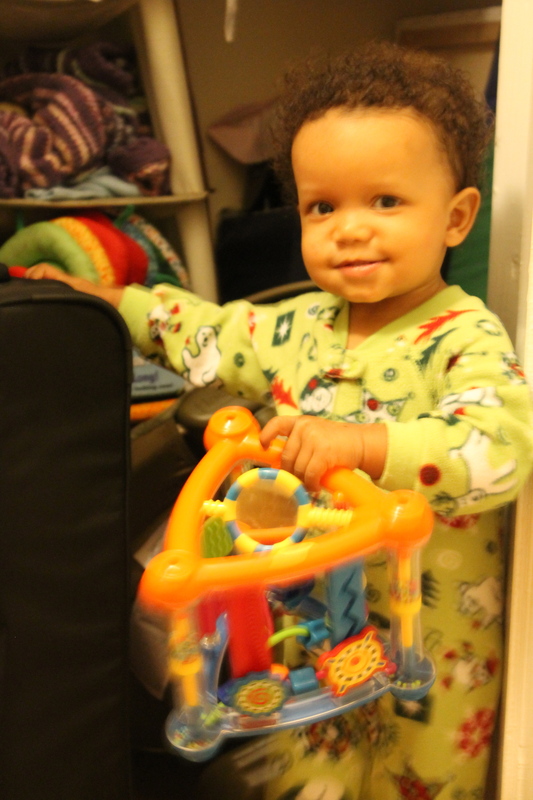 I pack our bag, water bottles, and snacks for our stroller fitness class and begin cleaning up our breakfast dishes. Meanwhile, back in our bedroom, David tells Zoe where she and I are going. 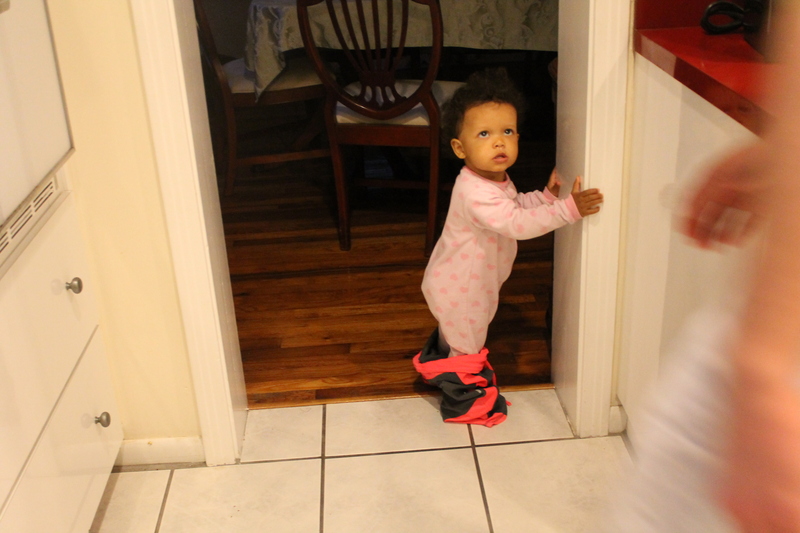 No joke—she finds my exercise pants, gets David to help her put them on, and comes out to get her stroller. …and thankfully have not had this type of wardrobe malfunction during class. 7:30 David leaves for the gym. 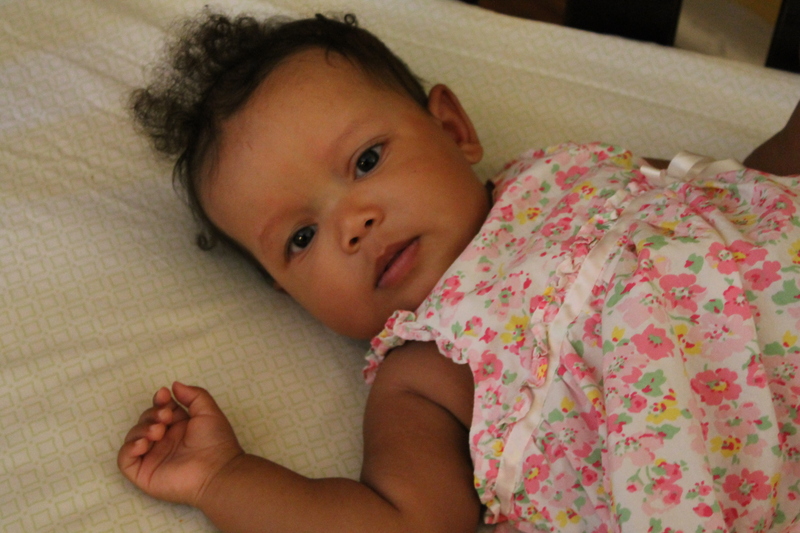 I toss a load of dirty laundry into the wash and begin getting Zoe dressed. 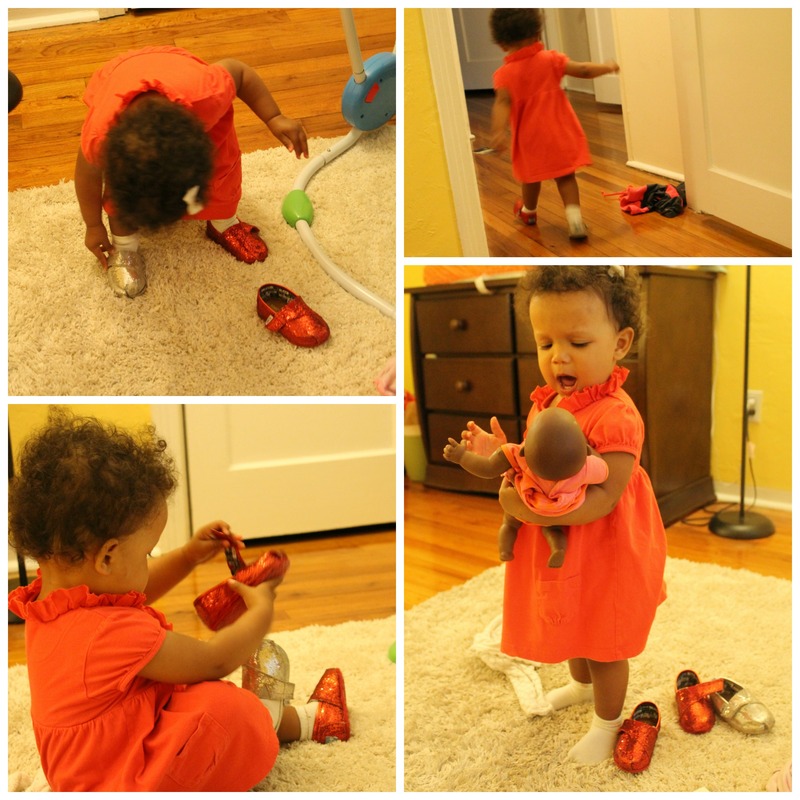 Today, this involves a tantrum about shoe choice. “But mom, I don’t want to wear my brown shoes. I want to wear my red shoes. I mean, my silver shoes. I mean one red one and one silver one. I mean no shoes. 8:00 Zoe is dressed. Finally. I throw contacts in my eyes, my hair in a messy bun, and some exercise clothes on. 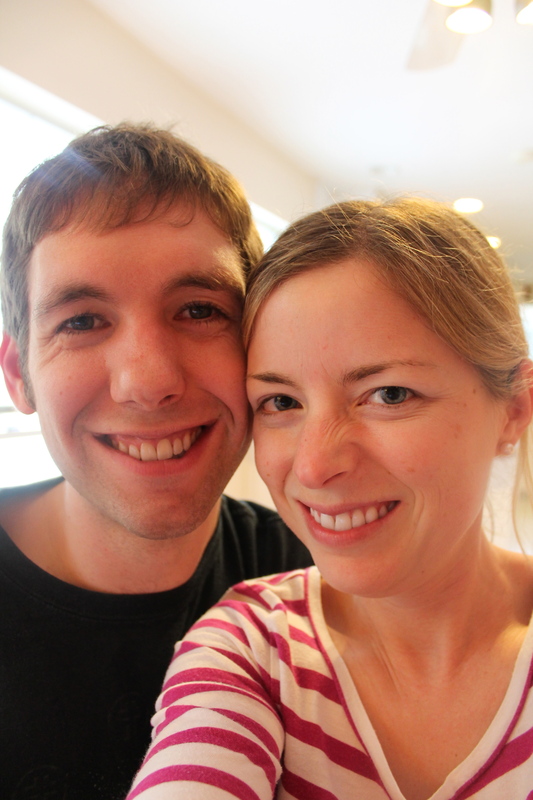 We sing a few songs and take a quick selfie before we begin heading out the door. 8:20 We are off. Usually, we listen to upbeat and peppy worship music. Today, we’re listening to our Christian radio hosts share some profound truth about grief and faith. I find myself sobbing. 8:45 We arrive and meet up our friends Heather and Quinn. 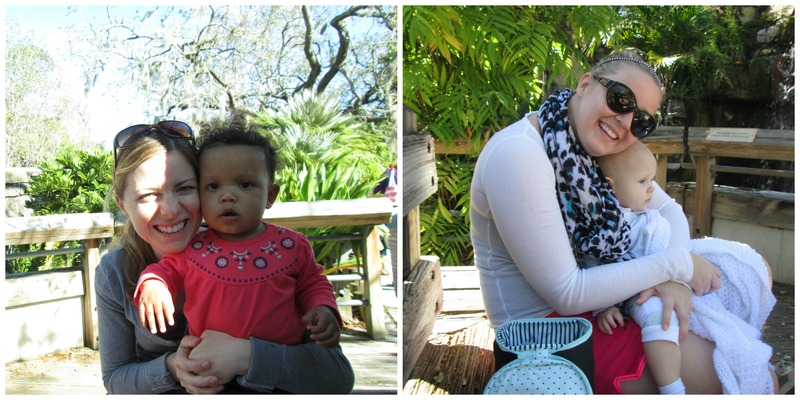 We also meet a new friend, Caitlin, and her little son as we all unload our strollers and workout gear. 10:10 Heather, Caitlin, and I have taken the babies to the “family bathroom” to change their diapers. I don’t usually talk about diaper changes when I do these posts, but this one was notable because all three kids were hysterically wailing as we changed them. House of pain, party of 3. 10:20 Play time at the mall play area. I love this place because everything is sized well for a toddler, there are no hard edges, and it’s carpeted and climate controlled. I eat a Greek yogurt as I chase Zoe around, and as usual, she wants some. Heather DOES capture this moment. 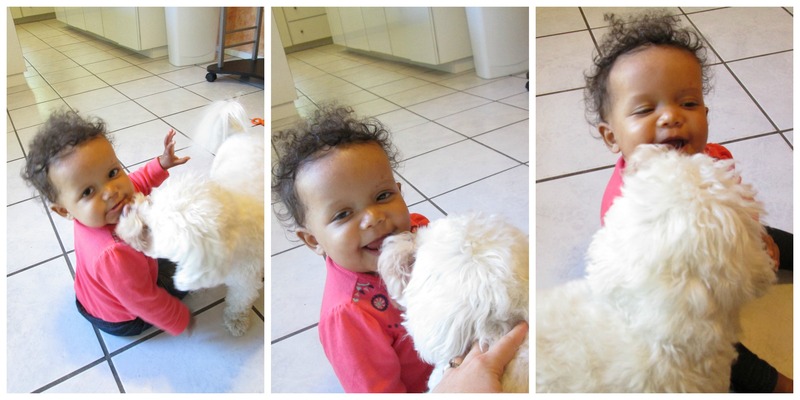 During our playtime, Zoe makes friends with a two year old. They chase one another around giving “high fives” for a while. Then the two year old teaches her how to fist bump. Classic. 11:15 Quinn has his one year photo shoot this weekend, so Heather asks for help finding him an outfit. She has made an inspiration board for his photo shoot on Pinterest, which impresses me. We find an outfit right away. 11:25 Zoe is looking sleepy, so we head towards the car, pack up, and hit the road. She falls asleep about 10 minutes into our drive. 11:45 We run into a minor car accident outside our neighborhood. We sit there for a few minutes waiting for the traffic to clear. I can see one of the drivers—a teenage girl. She is hysterically crying, but is being comforted by a bystander. The woman is holding her, rubbing her back, offering her a phone, and generally reassuring her. I am too far away to do anything helpful, but I pray for the girl and thank God for sending this woman to help her and for letting me see this glimpse of humanity outside my door. 11:55 Home. I wake Zoe up and head inside. 12:00-12:15 I take a few minutes to clean up our toys from the morning and switch some laundry while Zoe plays. 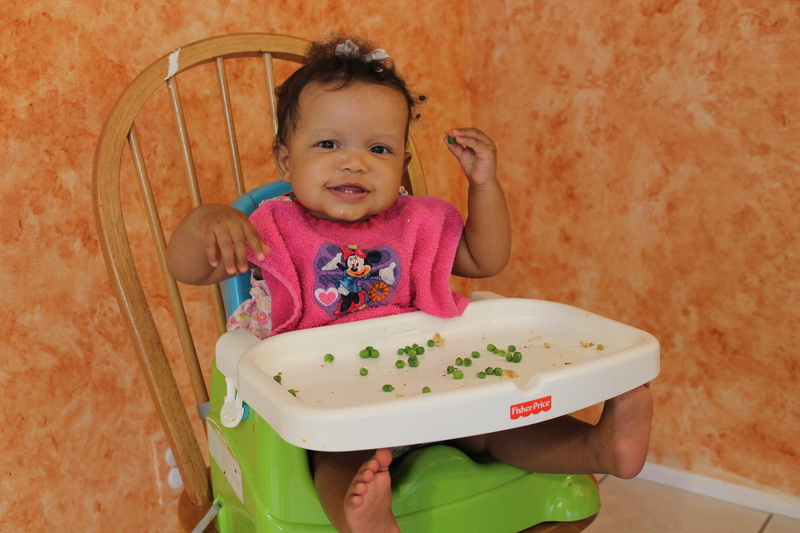 12:15 I put Zoe in her high chair and begin her lunch courses: green beans, cheese, multigrain crackers, and cherries. David comes home and I tell him about our morning. He says, “you had some deep car rides today.” Oh, my poor husband. 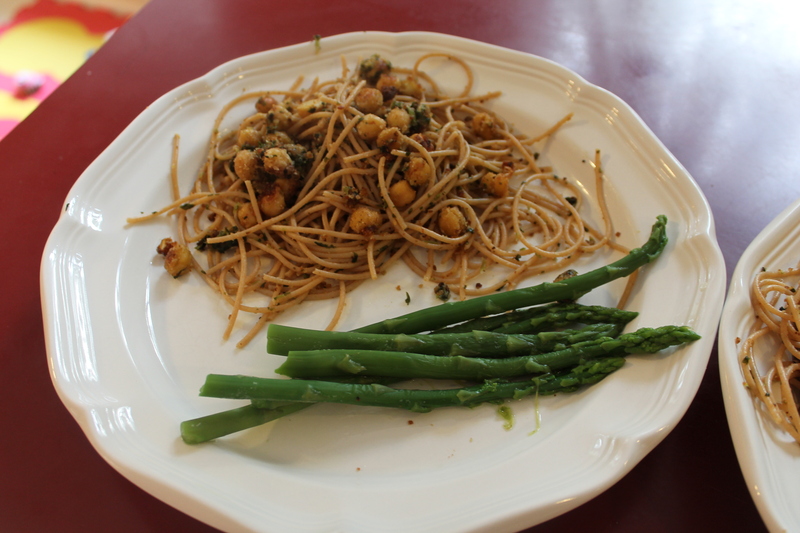 12:20 My friend/mentor Jennifer from Rochester calls during the green bean course. 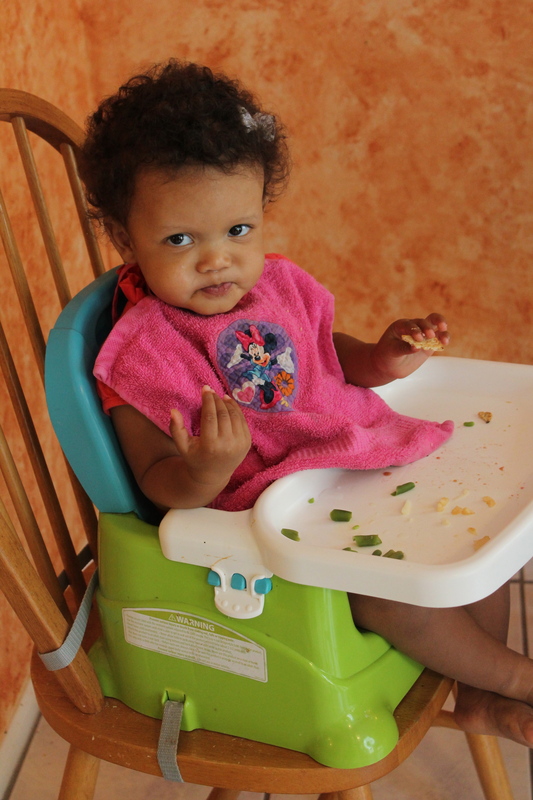 I talk with her as I make and eat my own lunch (spring mix with goat cheese, almonds, apple, and poppyseed dressing and some multigrain crackers) and bring Zoe her courses one at a time. 12:50 Zoe drinks her bottle while I check emails. 1:10 Zoe throws down her bottle and begins running around energetically. The car nap has invigorated her. We play, then I read her some books in an attempt to wind her down. I tell her to pick the “last time” book. She chooses a 150 page Curious George treasury. Nicely played, Zoe. 1:35 I put her in bed and leave the room. 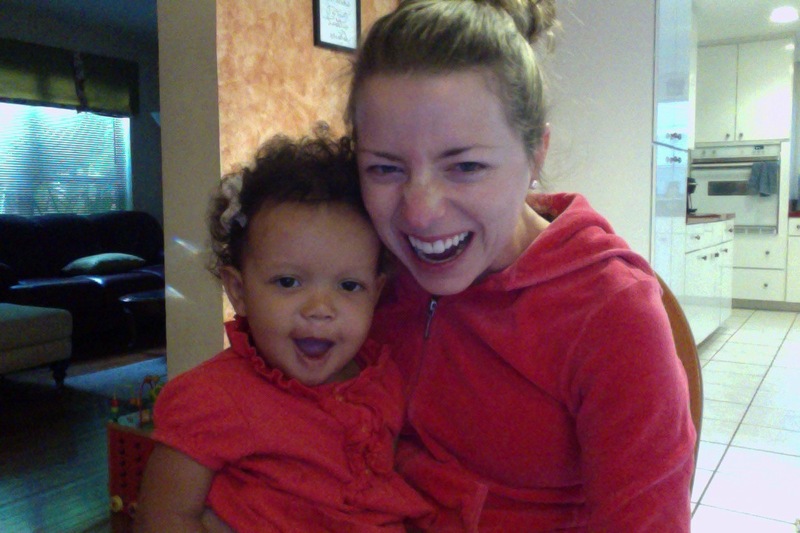 She shouts “NO NO NO” for a while, then says “Dada? Dada?” hopefully. I giggle and hop in the shower. 2:15 Zoe is still chatting in bed, which is super unusual for her. I decide to give her 5 more minutes before giving up on the nap and going to get her. 2:20-3:45 Zoe is asleep. I finish cleaning the bathroom, unload the clean dishes and load our dirty dishes from breakfast and lunch (the pants incident distracted me earlier,) clean the kitchen, send our friend Cailin some soy, dairy, nut, beef, and wheat free recipes (her baby has developed allergies and she is nursing, so she has had to dramatically change her diet,) check Facebook and a few blogs, write back to some emails, order some stuff on Amazon, and do my quiet time. Around 3, I eat half of a Larabar ALT bar and drink some green juice. Ahh. This is nice. 3:45 Jaima is not scared of the snot. We had planned to meet at 4 at a park, but Zoe is still sleeping. Jaima graciously agrees to drive over with her son who is awake so that we can still catch up (I mean, so the BABIES can socialize. Right.) In preparation, I go outside and clean Zoe’s water table. 4:05 Zoe wakes up. She is not happy. 4:10 Our buddies arrive. Zoe is so excit—oh wait. 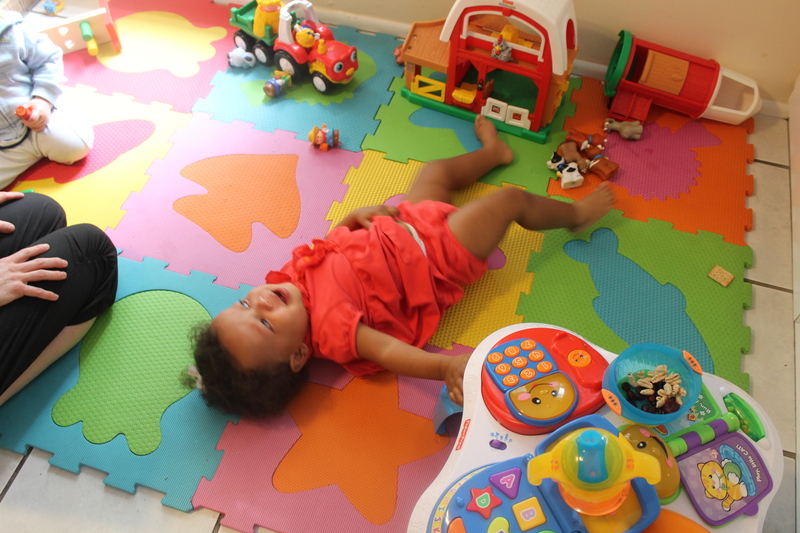 She’s throwing a tantrum. Eventually, Zoe calms down (although she remains prickly towards me and our visitors and refuses to eat her snack of craisins and kamut puffs.) Jackson remains unphased and plays with his favorite toy at our house—Zoe’s wooden work bench. We play inside for a few minutes before heading outside. Zoe and Jackson love our backyard. 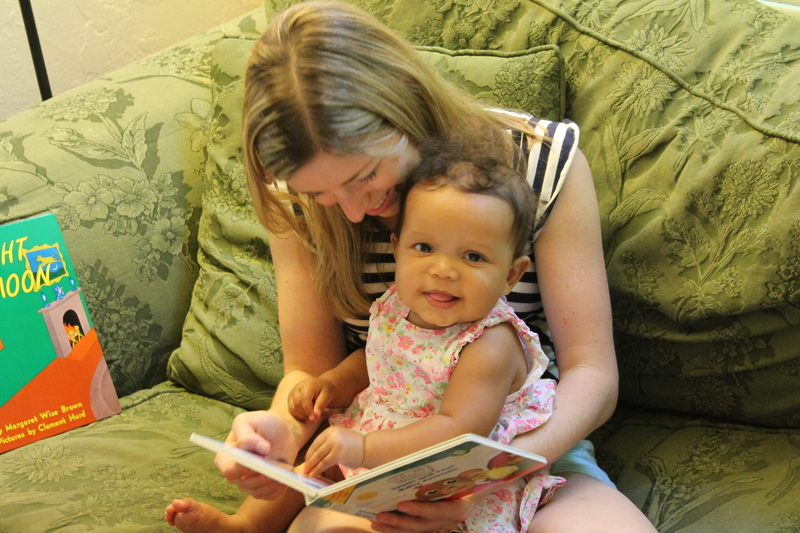 As we play, Jaima and I discuss her latest reading—Happiest Toddler on the Block and Leaning In. 5:05 Zoe cries because David is home (THE HORROR!) and cries again when J&J are leaving. Transitions are a little hard for her right now. After warming up to David and getting over the tragedy of our friends leaving, she runs to grab the dog’s leash and walks to the back door calling “DOG!” with the leash. I guess she understands our routine. We call David’s best friend/Zoe’s honorary uncle Kenny to see if he wants to join us for a walk (he does.) We take the dog for a 1 mile walk. 5:40 We’re back home. Apparently, it’s “help yourself to a snack” time around here. 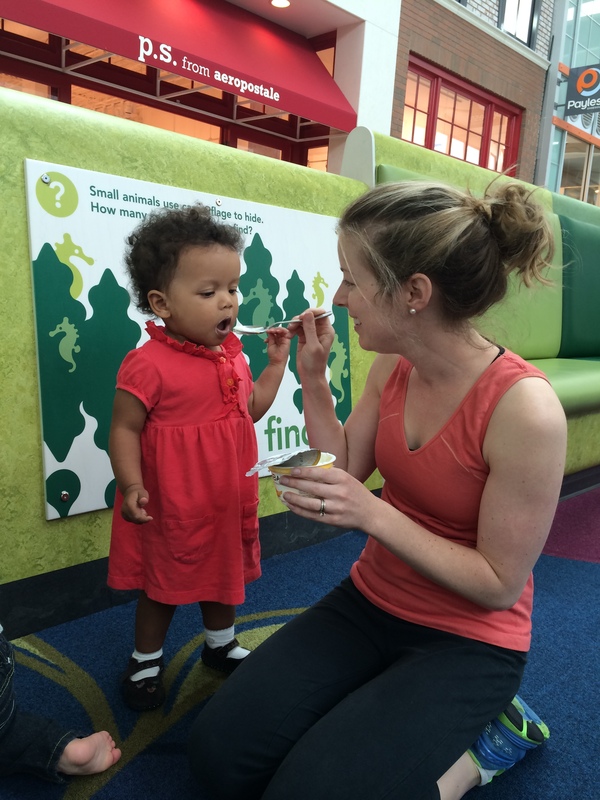 Since Zoe skipped her afternoon snack, I let her eat her second organic cereal bar of the day. I also put the box up higher in the cabinet 🙂 I pour a glass of wine for David and me, put out some hummus & carrots, and snuggle with David for a few minutes enjoying our happy hour. 6:10 Zoe eats some dinner—quesadilla, carrots, grapes, and avocado—while David supervises her and I cook. 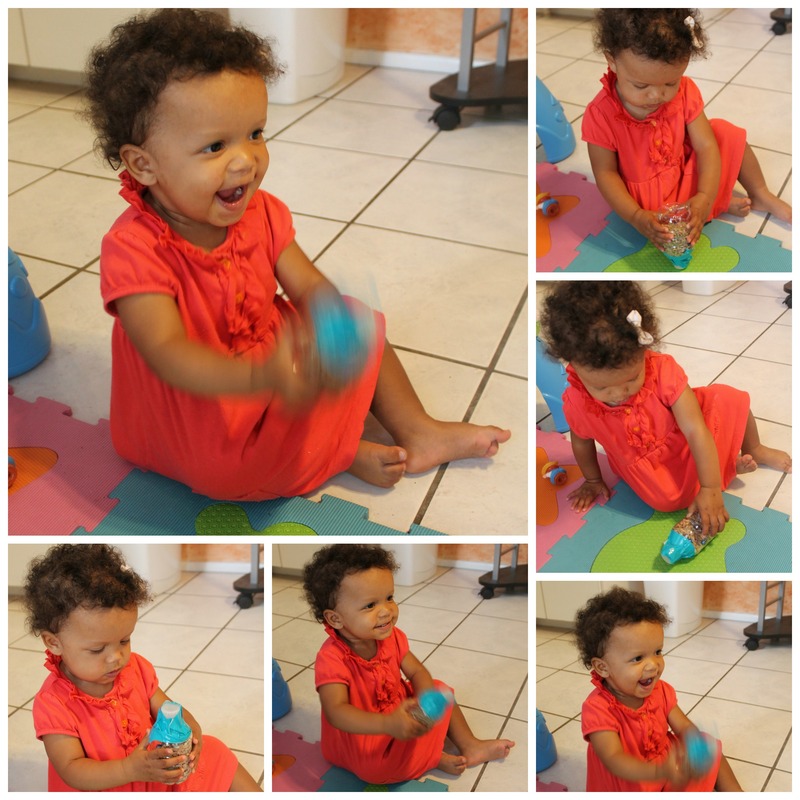 While we eat, we give Zoe some “discovery jars” we made for her yesterday during nap time. These are a Montessori/Reggio Emilia idea that I got from our church preschool and Heather, who used to teach there. Basically, they are bottles filled with interesting things to explore. I try to plan a few new sensory learning activities each week. This one is a hit. 6:50 We eat a dark chocolate square for dessert. David gives Zoe a bath while I do the dishes. 6:55 I realize that Java is suspiciously quiet and find out why. 7:10 David has wrestled Zoe into her PJs. She comes to see me, then runs into her closet to hide. We play “where is Zoe?” for a few minutes. 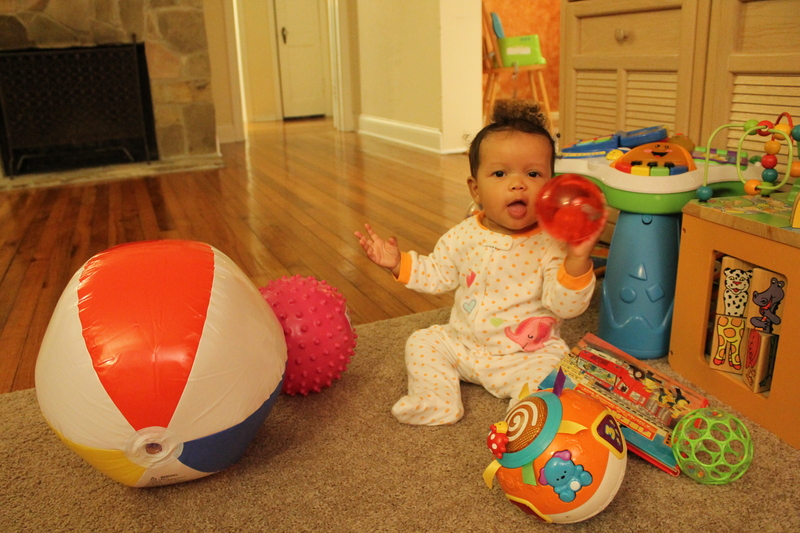 7:15 David and Zoe enjoy their nighttime ritual: sports and a bottle. 7:30 Zoe, David, and I sit on her bedroom floor and read three books together. Then we put her in bed, hold her hands and say a prayer, and leave her room. 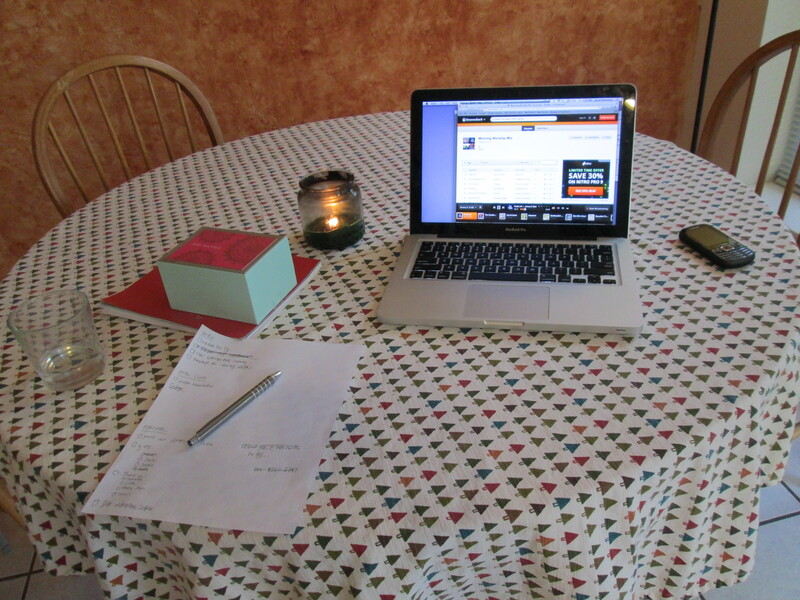 7:50 I switch the laundry and begin writing a quick summary of our day. David makes some popcorn. 8:10 I show David some research I did for a project we are working on. 8:30 We watch last night’s episode of “The Good Wife” on the couch, then spend some time chatting about where the writers of the show can go from here. I still can’t believe Will is dead. I put the last load of laundry into the dryer. Glutton for punishment? Feel free to read our 3 month, 6 month, 9 month, and 12 month posts, too! 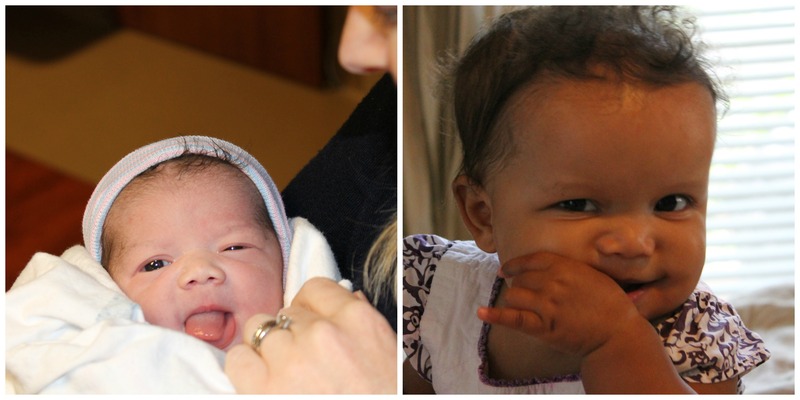 If you’re just joining us, I’ve been trying to post a “day in the life” post every 3 months so that I can keep track of how Zoe is growing and developing over time! Feel free to read our 3 month, 6 month, and 9 month posts. 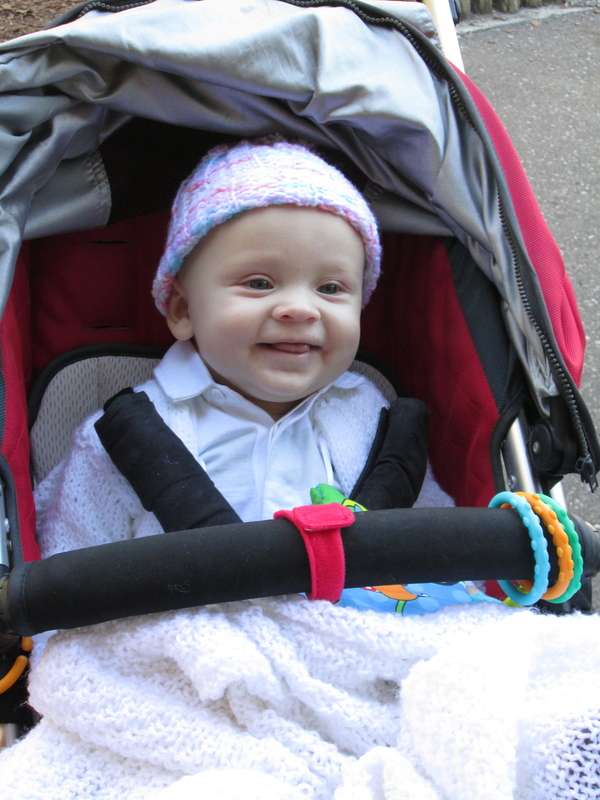 And now…12 months! 5:30 Zoe begins crying. She has been asleep since ~7:45 the night before. I get up and make her a 6 oz bottle of whole milk. She lays on my lap and I give her the bottle (Zoe has never shown an interest in holding her own bottle–diva) while I catch up on emails and Facebook posts. 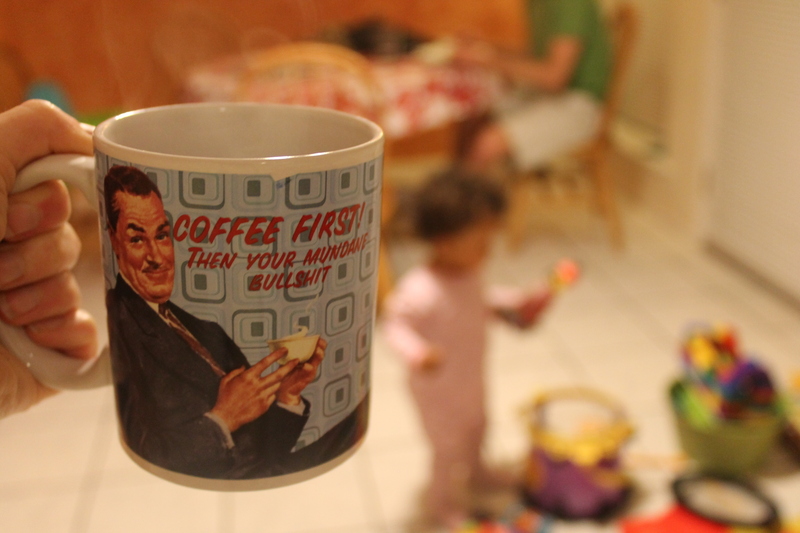 Then I make a pot of coffee. 5:50 PLAY TIME! We play with balls, a new “cookie jar” sorting tool that a friend gave us the day before, stacking cups, and Zoe’s activity table. Zoe has recently learned about our iPod docking station, so at one point she crawls over, points to it and says “dat” (that.) I oblige and we rock out to Jamie Grace together. As we play and dance, I get through a few passages of scripture and my cup of coffee. This is my favorite part of the day. When David gets up with her and lets me sleep in, I am genuinely sad to miss it! 6:30 David wakes up and comes out to join us. We play for a few more minutes and then everyone eats breakfast: a yogurt, berry, and cereal bowl for David; an oatmeal pancake with yogurt and berries for me; and bite-sized pieces of a whole wheat pancake, banana, pear, avocado, and yogurt for Zoe. I finish my Bible study as we eat. 7:15 I shower and get dressed while David plays with Zoe. 7:30 It’s David’s gym day, so he heads out to get his workout on. I give Zoe a bath and wrangle her into fresh clothing. 8:10-8:55 MORE PLAYTIME! Zoe and I do some physical play in her room with her pop-up tunnel and her favorite toy—plastic clothing hangers. 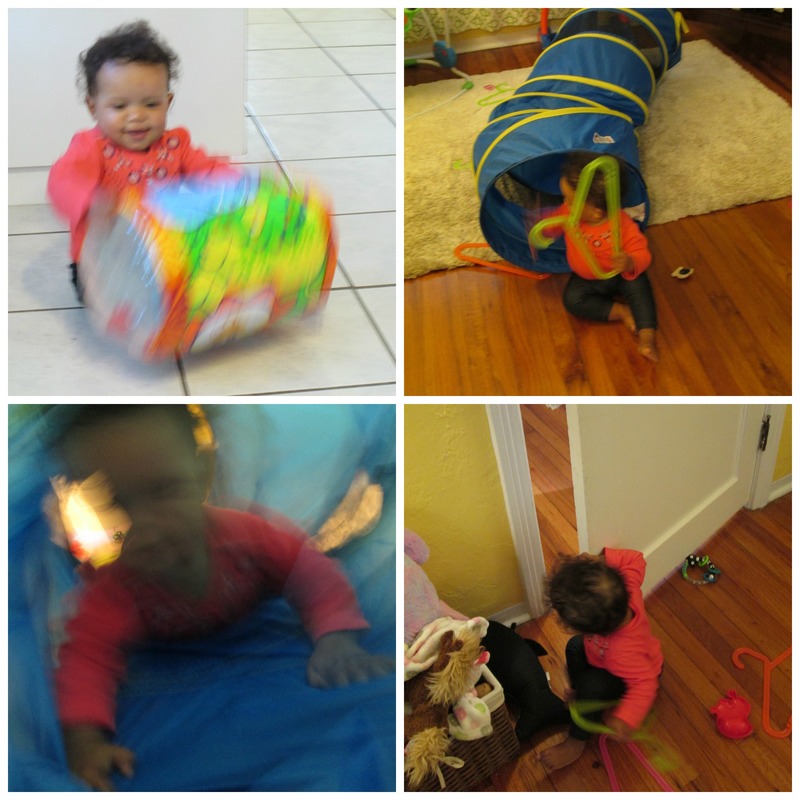 At one point, she decides (without warning) to fall onto her pop-up tunnel hoping it will hold her weight. No such luck. Tears. 9:25 We arrive at the zoo. Zoe has fallen asleep in the car, which I expected. She typically takes two naps a day, and this outing is actually during her normal nap time. I find it almost impossible to go out and do fun things with her if we are strict with the nap schedule every day, so I compromise: I am strict with her afternoon nap schedule every day of the week and have her flex her morning nap around 1-3 days/week so that we can go out and do some mid-morning activities. Today is one of those “flex” days. 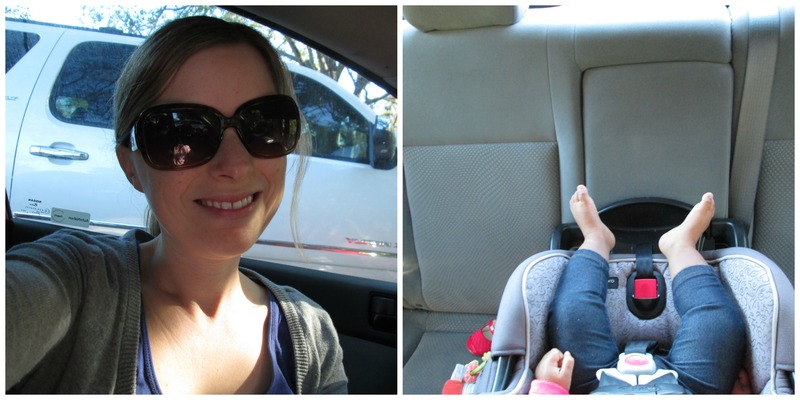 I let her take a 25 minute car nap before we head in to the zoo with our buddies. As she naps, I listen to the radio and text with my friend Jess. 9:40 We stroll into the zoo with our friends Heather and Quinn. Quinn is adorable, and hence deserves a photograph. 9:40-10:50 Total fun. 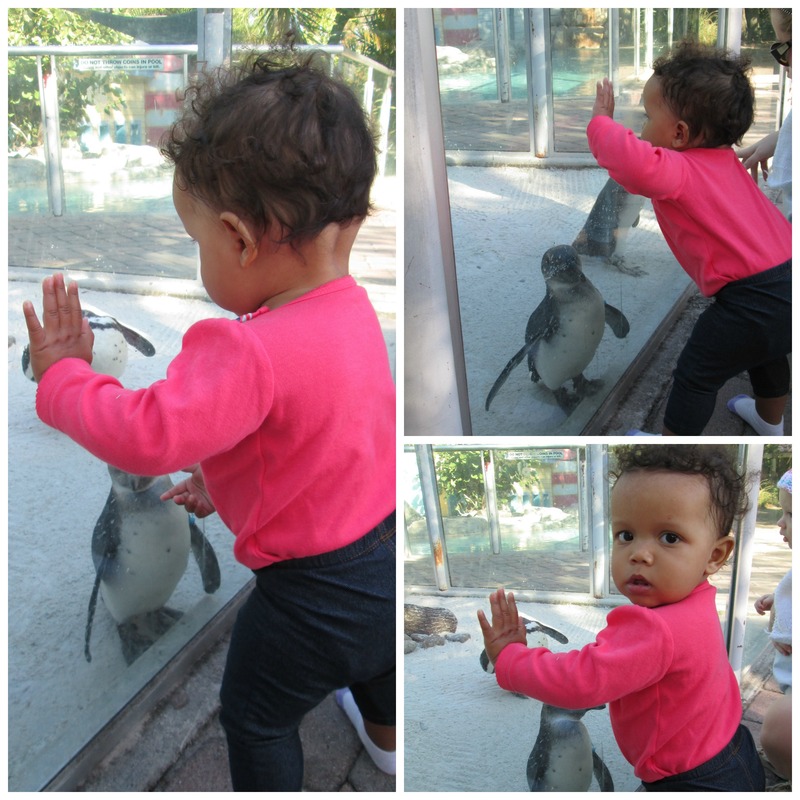 The kiddos love the animals, especially the penguins! 10:50 Snack time. Quinn has a bottle and Zoe and I each have a quarter of the PB&J sandwich I packed. 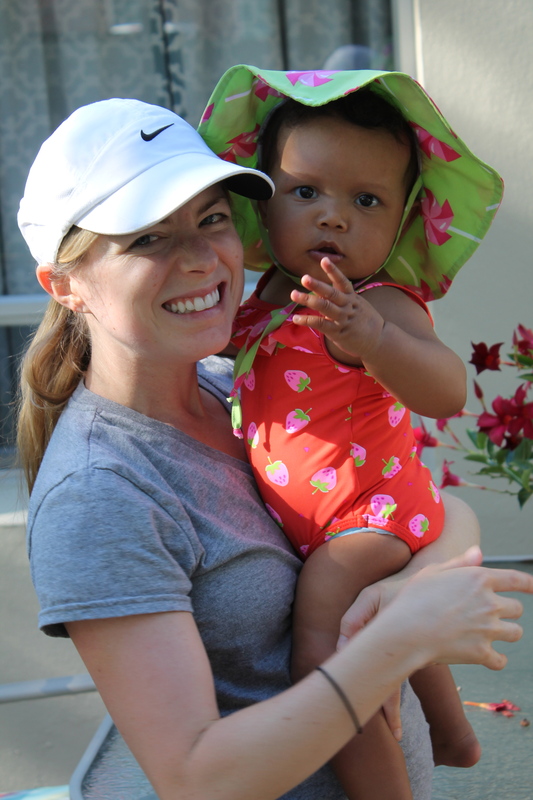 Heather and I chat about life and how fast our little ones are growing. After this, we visit other animal exhibits (manatees, fish, turtles, bald eagle, snakes, monkeys) and discuss Montessori, Reggio Emilia, and Waldorf at-home activities before heading out. 11:40 Ready to head out. When I put Zoe in her carseat, she immediately cries (which is her response now whenever we leave somewhere “fun”) so I’d call our outing a success! Zoe falls asleep on the way home. 12:15 We arrive home and say hi to David, who is home eating lunch too. I wake Zoe up, which takes a few minutes of concentrated effort. 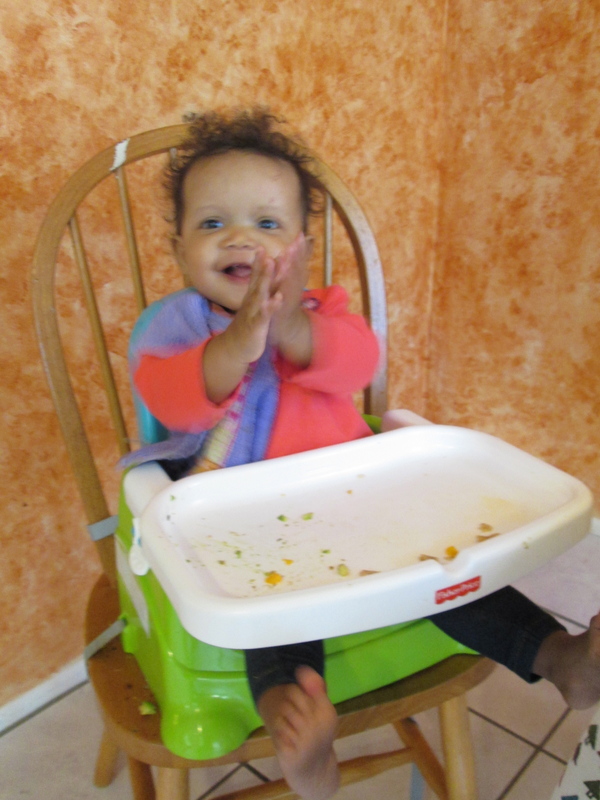 We each eat lunch–bite-sized pieces of a whole-wheat quesadilla, avocado, mixed veggies, and banana for her and a melty avocado/goat cheese/tomato wrap with a side salad for me. 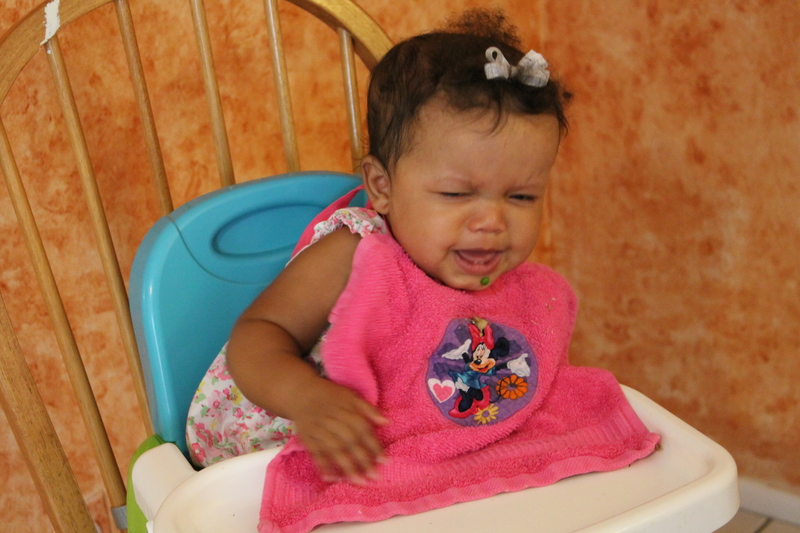 Zoe is NOT happy to be awake and eating lunch. THE HORROR! It’s amazing what a little food can do to your mood. 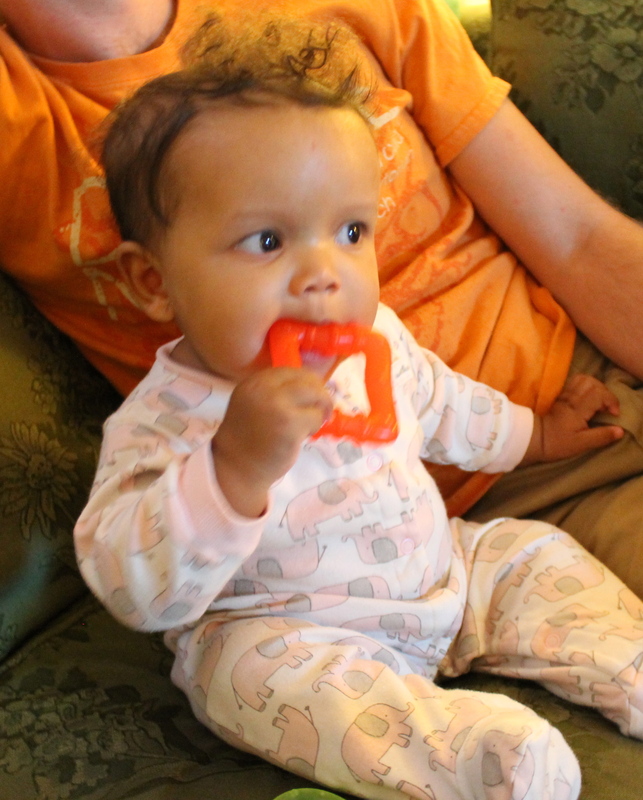 1:00 After lunch, I feed Zoe a 6 oz bottle of whole milk while catching up on blogs and emails. 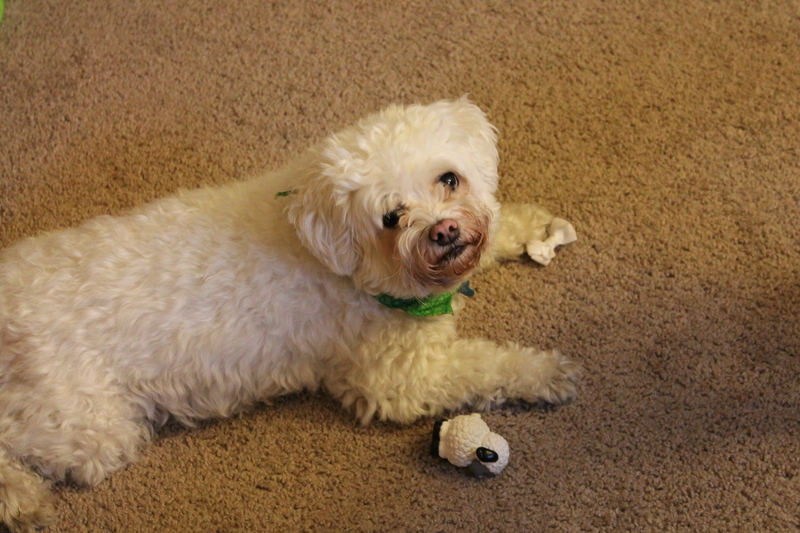 Then…dog time! It’s hard to keep these two from French kissing. 1:10 Play time! I used to do “reading time” after lunch, but now Zoe wants “crazy physical time” after lunch. 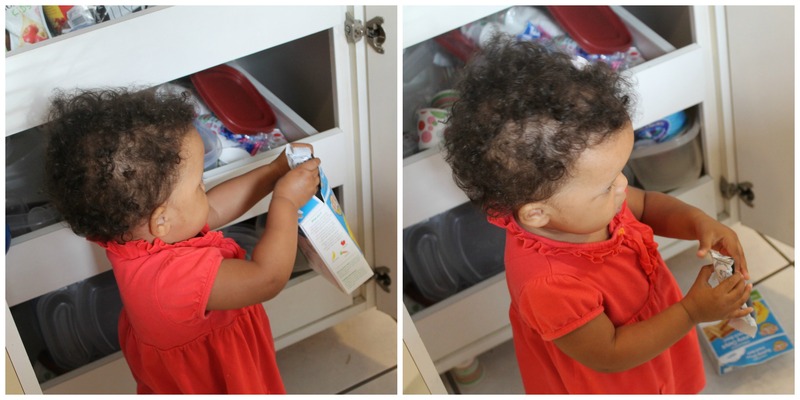 First, she crawls around the kitchen opening the cabinets that aren’t childproofed and finding the surprises I hide for her in them. Then we go back to her room. General mayhem ensues. 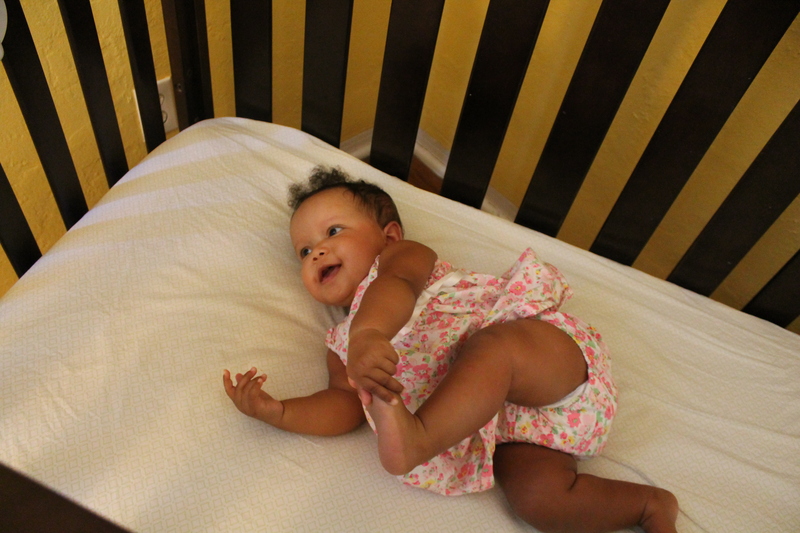 Finally, we wind up on my bed for 10 minutes of her favorite game—“1, 2, 3” (she falls backward on 3.) Massive giggle fits from both of us. 2:00 I try to help Zoe calm down with a few books on the couch. She looks exhausted. 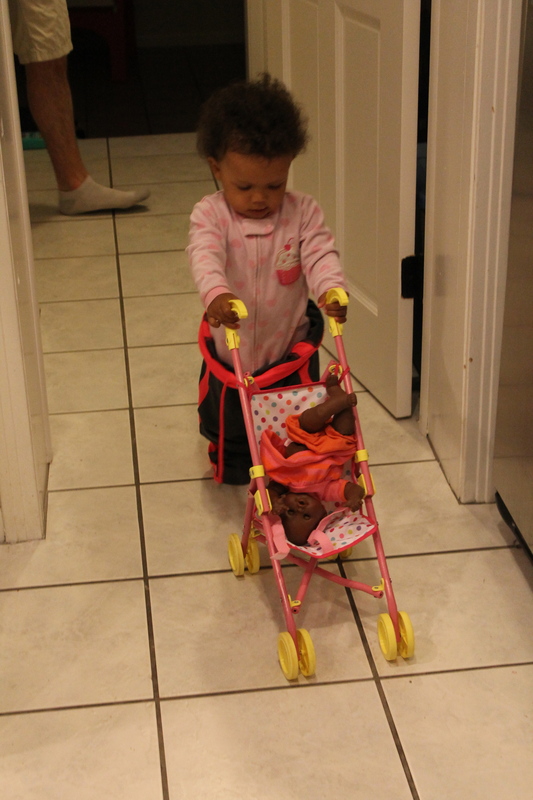 2:10 I put Zoe in her crib with her sound machine on, say “goodnight,” and walk away. Instantaneous sobs. I try to ignore them as I collect the trash. 2:15 Still sobbing. This week, she has needed me to rock her to sleep for her afternoon naps because she has a little cold. It’s SO sweet, but I am really on the fence about whether I want this to become a habit. Regardless, I go in and rock her until she is almost asleep. Then my nose starts bleeding (random!) I ignore it for a few minutes but the situation is becoming dire, so I stop rocking her and put her in bed. Her sobs die in 2 minutes as she settles into sleep. 2:30 I finish emptying our trash cans and indoor recycling bins into our outdoor bins and clean up the kitchen and living room. Then I light a candle and listen to worship music while I write some thank-you notes, respond to a work email, write a few emails related to a project I’m working on and start working on the winter newsletter for the club I am president of. I also have some yogurt and pear slices. It’s a great 40 minutes of peace and stillness in my day. 3:20 One of my favorite high schoolers shows up. 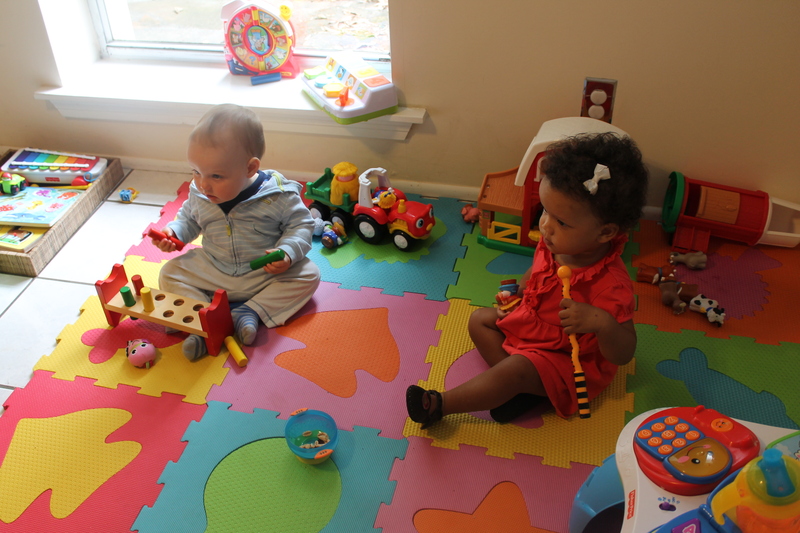 3:45 Head to the Christmas party, which is geared towards the three 10 month–13 month attendees and a 3 year old. 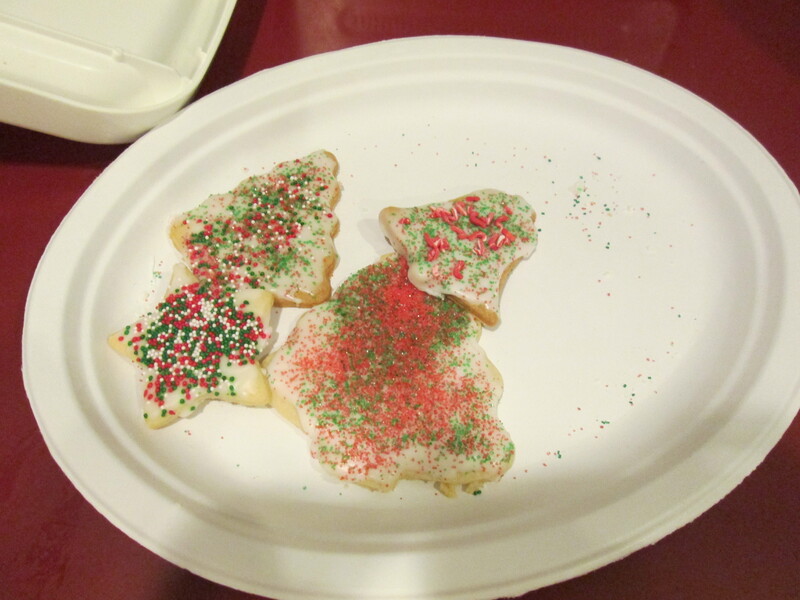 There are presents, jingle bells to shake, stuffed animals to hug, a nativity scene to play with, and cookies to decorate! SO MUCH FUN. 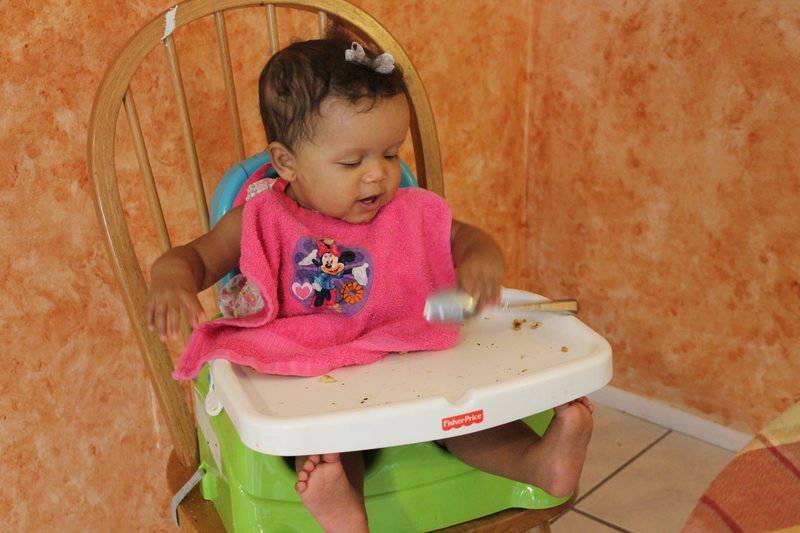 While there, Zoe eats almost an entire sugar cookie. It’s a party, after all. (I eat a cookie, too.) I also get a phone call related to my project. 5:05 I put Zoe in the car. More tears. We head home and I start chatting with my mom on the phone. David gets home around 5:20. I finish chatting with my mom and we take the dog for a walk. Zoe loves our neighborhood right now with the Christmas lights and inflatables. Who am I kidding—I do too. 6:00 I start prepping dinner—calzones. I had a lasagna fail earlier this week (apparently the noodles were “pre-boil” noodles, which I don’t usually buy) so I scraped out the totally functional sauce, pesto, cheeses, and sautéed veggies from around the burnt noodles to re-use in calzones. Making lemonade out of lemons is so 2012—the cool kids of 2013 make calzone out of burnt lasagna. 6:20-6:50 Dinner time. 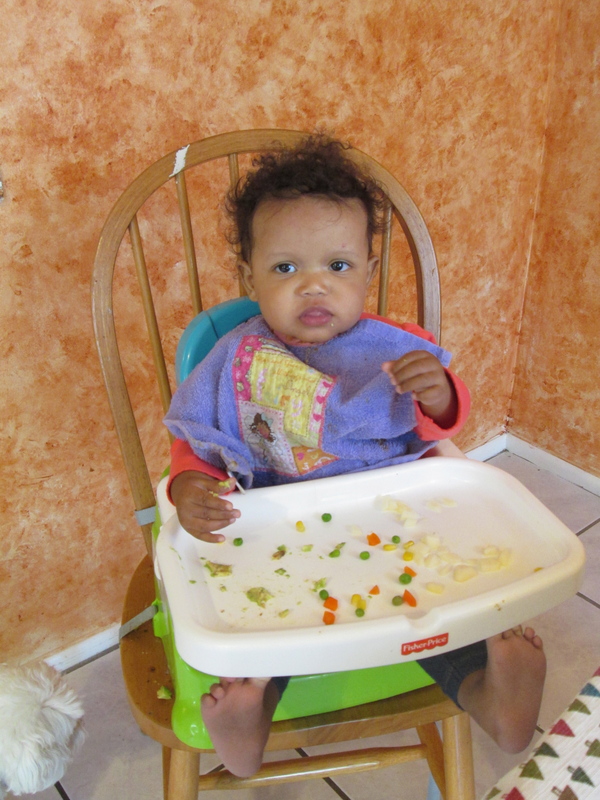 Zoe eats bite-sized pictures of calzone, mixed veggies, and finishes her yogurt from earlier today. David and I eat calzones and salad and make plans for the next day (which is his day off…I am working until 2:00.) 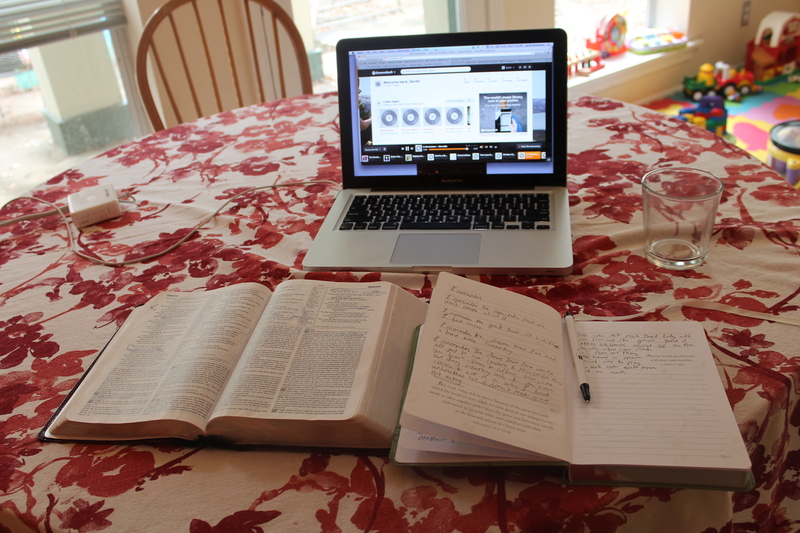 I begin prepping for the high school girls Bible study that I lead. Tonight, our theme is “holiday party” so prepping involves cleaning up from dinner, getting hot chocolate and mugs out, and preparing our cookie-baking supplies. 7:10 David and I are getting Zoe in her PJs when the first student shows up, 20 minutes early. We catch up as I finish prepping for the party. Zoe is slowly melting down. 7:30 The sound of high school girls (and a few girls who are back from college and wanted to come too!) 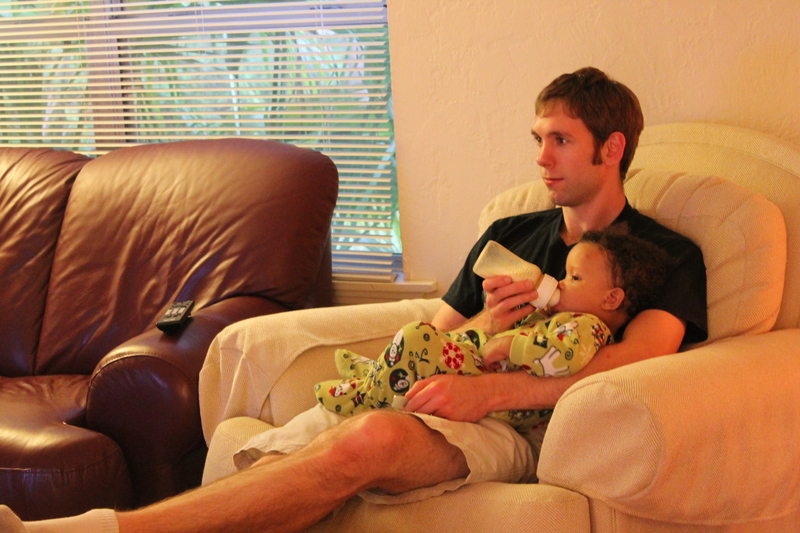 fills the house as David puts Zoe to bed with her last bottle of the day (8 oz.) She is tired, probably because I didn’t respect ANY of her naps today, so she falls asleep in spite of the noise. 7:30-9:15 PAR–TAY. 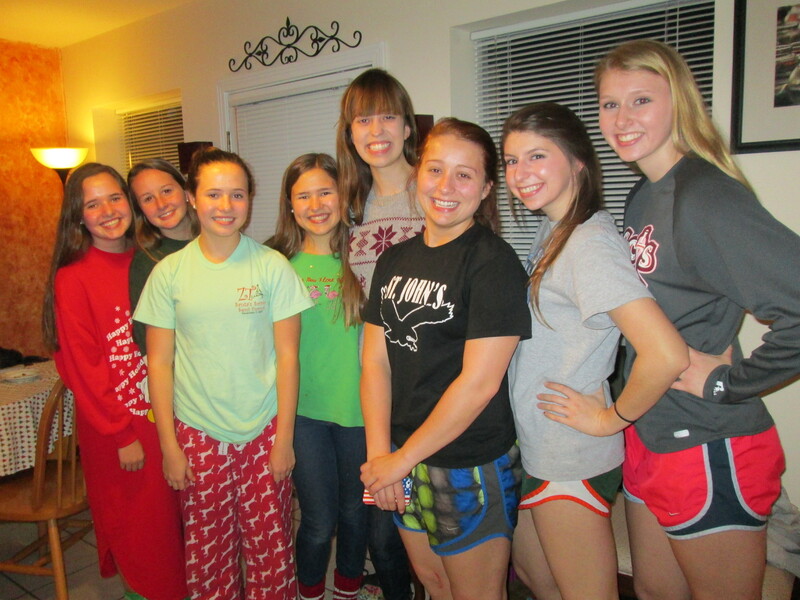 Cookie-making and eating, Christmas music, YouTube video watching, stories, and laughter occurs. I eat another cookie and wash it down with some soy milk. Yum. 9:25 The last student heads out. I look at my dirty kitchen and decide to clean it in a few minutes. I sit down. I’m an introvert, so I always need a few minutes after events to recharge. This time, I write an email to my prayer group. David comes out and starts cleaning the kitchen, which is very nice of him. I eventually get up to help him. 10:15 We get ready for bed and hit the hay.